On the coast, not far from where I live, is the city of Brighton. It has a sort of chequered reputation: known for “Dirty Weekends”, the “Brighton Quickie” divorce and being, at one time, saddled with the dubious title of “murder capital of Europe,” it is also a vibrant, fun and quirky city with an enthusiastic night life and a 365 day carnival jutting into the English Channel otherwise known as “the Brighton Pier.” I recommend a visit. Go there. Right now. 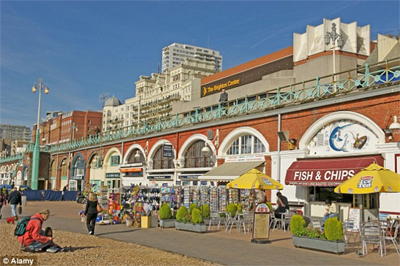 Really, a visit to Brighton is a nice day out. And it's got a fairground midway. On a dock! 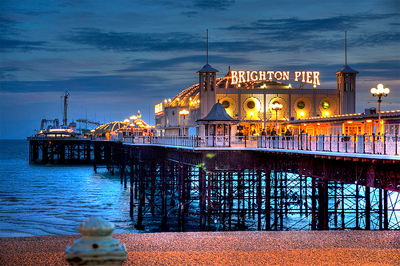 Next to Brighton is Hove, and together they make up the municipality of Brighton and Hove. They are so close as to be nearly indistinguishable, but the people who live on the Hove side like the idea that their city does not have a tarnished past and doesn’t parade around like a tarted up trollop thinking that being popular and wearing a nice set of clothes passes for respectability. 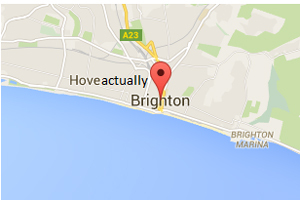 This has given rise to the area known locally as Hoveactually. 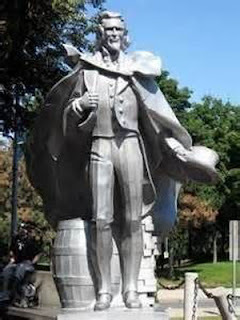 That's Uncle Sam. Yeah, he's from Troy. There are probably other cities where the residents, instead of admitting to it, insist that they live somewhere else, but no place that I have heard of has taken this as far as Worth. Worth is a small section of the much larger town of Crawley, which is a sprawling New Town, built after the war as a dumping ground for bombed out cockneys, at the expense of the tiny village it engulfed. 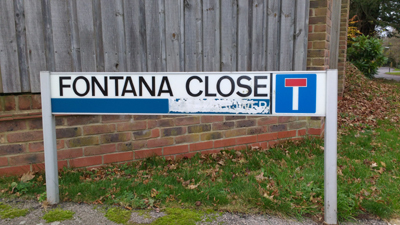 It is not the most desirable of locations so people from Crawley generally identify themselves by their neighbourhood. My wife, for example, is from Crawley, well, Pound Hill, actually. Now, nestled within Pound Hill, and the neighbouring neighbourhood of Maidenbower, is Worth. Worth is the area surrounding the Saxon-era church. It is a very desirable address even though it is not, I am told, a political entity; it is simply a loose collection of lanes lined with expensive and fetching houses wherein reside people whose burning desire is to NOT live in Pound Hill or Maidenbower or, heaven forbid, Crawley. I have to admire these people, for they have taken the pretence of living somewhere that you actually do not live to a whole different level by “updating” the road signs on the streets where they live. 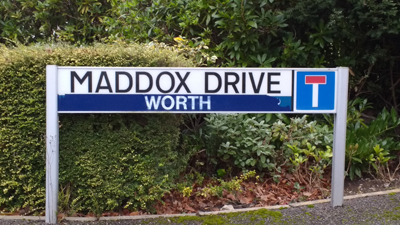 STEP 1: remove the official neighbourhood name from your road signs. (even if it is imaginary). STEP 3: Repeat as necessary. The amount of effort and dedication, not to mention self-delusion, to pull this off is staggering. 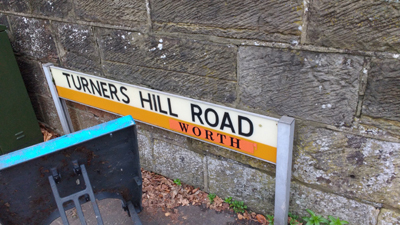 I bet their address reads “Turners Hill Road, Worth” on their bank statements and utility bills, as well. And I also bet the Troylettes are kicking themselves now for not having thought of it first. Ah yes, I live in St Paul, MN which is the Twin City to Minneapolis. Most people in the state simply refer to us as living the "The Cities"--which is fine. However, when they want to get more specific, they default to saying "Minneapolis". Now Minneapolis is larger and has more theaters and museums than St Paul but it also has more gangs, crime and depressed areas. I am not from there! I always tell people that I'm actually from St Paul which is far more elegant with the stately Capitol and oodles of government buildings. Folks from Mpls may ridicule us for "rolling up the sidewalks" at night, but I'm fine with the lack of Saturday night shootings and gang wars! If you're ever in the neighborhood, St Paul has some wonderful theaters and museums, as well. The weird thing about Chicago (which has been here for quite a while by American standards) is that the neighborhood names keep changing. We have Wrigleyville (near the ball park) which older residents will tell you, didn't exist 40 years ago. V odd as they're not even new developments.